Photo courtesy of OnStage Dance Company. OnStage Dance Company, Malden, Massachusetts. 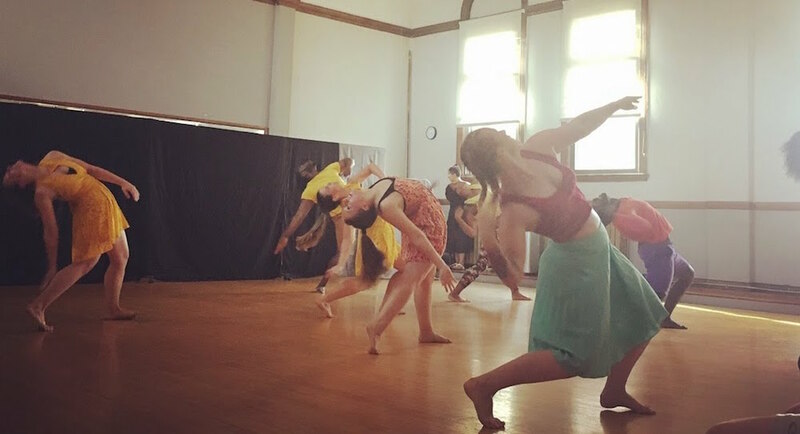 Dance can viscerally depict the human impact of certain events in our world. Paired with effective technical elements, such as voiceover, it – as a complete art form – can portray the wider scope of an issue with clarity and conviction. 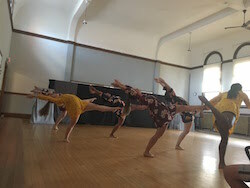 Connections Dance Theater (CDT) meaningfully achieved this in Prelude To: Hot Water Over Raised Fists, exploring two cases of threats to safe, clean water in the modern day. Water is life; our body contains more of it than anything else, and we can’t live without it for long. Even in recent years, and currently, commercial and political forces have threatened the availability of fresh water for certain marginalized groups. The dancing began with a stunning solo from Fridien Tchoukoua. 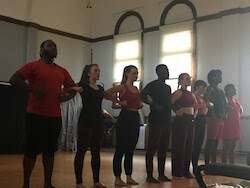 The movement had a base in traditional African dance, which was then peppered with contemporary dance inflections – flexed feet, floorwork and turns rooted in ballet technique. Parallel attitudes à la seconde and lunges were also common. A striking movement was a circling of the torso along with the forearms, the timing and quality together making it truly memorable. Tchoukoua seemed to have the spinal mobility of a snake – smooth and impossibly pliable. Two dancers, Stacey Badgett Jr. and Ndubuisi Ofoegbu, joined. The movement became slower and more gestural but was still luscious. Something in me wanted this section to be longer, so that it had more time to breathe and flesh itself out. Further dancers joined, and voiceover rang out – sounding like newscasters or documentary narrators, explaining the controversy surrounding Standing Rock. 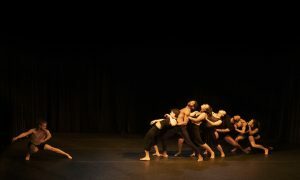 Dancers continued moving in expansive, innovative ways. Oliver’s movement has a discernible base in Horton technique, but she makes the choreography from that base her own striking, memorable aesthetic. She soon danced a solo. Oliver’s focused gaze seemed unshakeable as she dynamically moved through varied facings, places in space, and levels in space. Dancers remaining still behind her began to move with her. They moved in unison for a good while, with clear lines and expansive shapes – in bodies and in formation. Voiceover from a Native American woman described how the land at Standing Rock had been “treaty land which you promised you wouldn’t take.” My stomach suddenly flipped. Further historical context on these treaties came from voiceover in another section, describing other times in the past when treaties were broken. Movement had jazzy elements, with walks and pivots and hip isolations. Dancers wore vibrant yellow. A duet from Oliver and Amanda Jones began, one both chilling and striking; Oliver moved diagonally across the stage, only to be stopped by Jones at the downstage left corner, a part of her body caught. Sunny brightness – at least that existing for some involved – could only be temporary in this climate. This blocking of her path was a viscerally powerful way to signify power and oppression through movement. Further intriguing sections included a double-duet – two pairs of partners – wearing white and blue, lighter colors perhaps signaling purity. A sense of rise and fall in the movement, like waves, was clear. Toward the end, they stood in a line, holding hands, and pulled toward stage right – a community but one with tension. One dancer finally broke away from the line on a tug, and others followed. A couple of other sections ensued, until a powerful ensemble section ended the act. 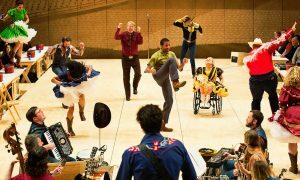 Clear, syncopated rhythm in the movement led to clapping the floor towards the end – then falling as the music cut out. It felt like this embodied the sense of exhaustion that the dancers likely felt! The movement was athletic and technical but also passionate and visceral. The second act similarly began with a solo from Tchoukoua, with an astounding blend of release and control. Leaps progressed into controlled développés, to more gestural and emotion-driven phrasework. “Freedom, freedom, freedom!” the score sang out. Dancers stood in back as if witnessing. Badgett Jr. danced a solo next, using his height and wingspan to be beautifully expansive in his dancing. Dancers in white returned, slowly moving through poses. Voiceover returned to describe the Flint, Michigan, water crisis, just as it had with the situation at Standing Rock in the first act. Movement picked up speed and strength in quality, with three dancers working together harmoniously and intuitively. Two-to-one structures, in formations and timing, were clear and well-constructed. One dancer moved high while the others danced in lower space, building spatial tension and signifying power dynamics, for instance. Call and response occurred with timing, passing energy and focus back and forth between a soloist and duet. Unison timing came again, bringing in memorably inventive phrasework. Dancers reached up with one arm to catch the other arm’s wrist to loop that behind the head. Gestural work like this blended into more codified movement such as attitude leaps. At a certain point, it did feel like codified, technical movement overpowered the gestural and powerfully emotional, and part of me wanted to have that balance back. Perhaps this shift had meaning that I didn’t perceive. 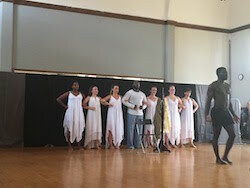 A duet from Ofoegbu and Badgett Jr. followed this section, demonstrating the best qualities of Oliver’s choreography – daring and inventive in timing and shaping, heartfelt and passionate. The dancers moved in and out of unison timing. Attitude derrière turns led into quick footwork. One dancer’s hands pressed to his chest, then reached down to fall forward as his body did. The other dancer swooped his arms in a circle overhead in a turn. The movement was refined, yet also had a rawness of intensity. 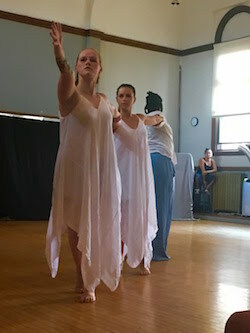 Three dancers joined, creating a powerful group of five dancers. Two danced on the outer edge, framing the three dancers closer to center stage. More voiceover rang out, heart-wrenching testimonial from Flint residents forced to pay high rates for water that’s poisonous to consume. Again, my stomach did backflips. The combination of voiceover and movement made the water crisis in Flint viscerally unsettling for me. Other well-constructed sections commenced until a final one took the stage. Electronica infused with the beats of traditional African music accompanied passionately energized movement. Red and black costumes supported this movement and music. Glissade-like traveling steps carried the dancers in half-circle formations. They then moved in lines, with daring and strongly accented phrasework. They ended with raised fists, a sign of protest. I was moved, my empathy called up, and I have to imagine many audience members felt the same. 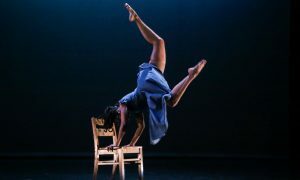 This can be the power of thoughtful choreography, skillful dancing, well-assembled technical elements and an important issue to which to call attention – all combined. The performance made clear that art matters in a world of many injustices, but also many who care. Related Items:Amanda Jones, CDT, Connections Dance Theater, dance review, Fridien Tchoukoua, Jenny Oliver, Ndubuisi Ofoegbu, Prelude To: Hot Water Over Raised Fists, review, Reviews, Stacey Badgett Jr.